Free download Debut Video Capture latest version. Download Debut Video Capture from direct download link. 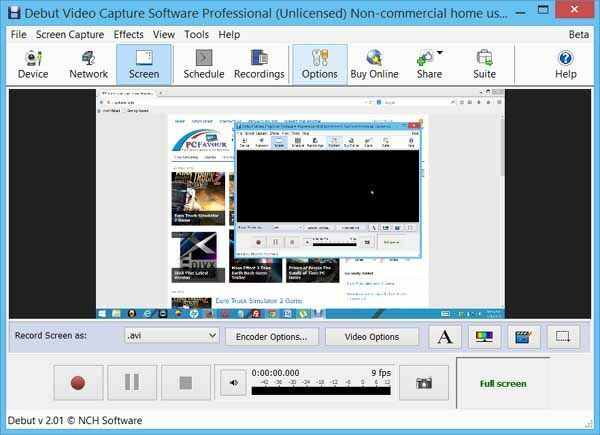 Debut Video Capture Software Professional is a perfect video capture program for your PC. You can record the video of your all types of work from your PC. Using Debut Video Capture Software, you can record your PC’s desktop, your all work from any application software and even record the videos of your Game Play. Debut Video Capture Software is compatible with all Windows version such as Windows XP, Windows Vista, Windows 7, Windows 8 and 8.1. As compared to CamStudio, you can use Debut Video Capture software using windows 8 or 8.1. Debut Video Capture Software is very light software. The setup of the program is not more than 1.5 MB. You can easily install it on your computer. It will take few seconds to install it. At the end, keep the default setting as shown in picture below. This will enables your captured videos to be edited by VideoPad Video Editor and allow you to burn videos on CD or DVD. Video recording from Debut Video Capture software can be start using F5 button or by pressing the red recording button at the bottom left of the program. The main menu contains Device, Network, Screen, Schedule, Recordings, Options, Buy Online, Share, Suite and Help menus. You can use any of them with the help of a single click. For example, after completing the recording, you can open it by clicking on “Recordings” menu.